The Carolina Hurricanes have signed forward Jordan Martinook to a two-year contract extension worth an average of $2 million per season. 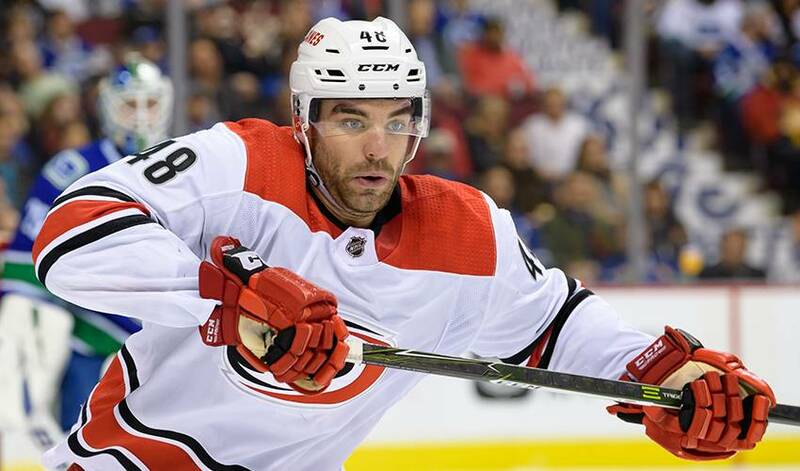 RALEIGH, N.C. — The Carolina Hurricanes have signed forward Jordan Martinook to a two-year contract extension worth an average of $2 million per season. General manager Don Waddell said Tuesday that Martinook's extension will begin next season. The 26-year-old Martinook has 10 goals and three assists in 50 games while leading the team with 125 hits and blocking 28 shots — the most by a Carolina forward. The Hurricanes acquired him in May from Phoenix in the deal that sent centre Marcus Kruger to the Coyotes. Martinook is making $1.85 million this season and would have been a restricted free agent on July 1. It's the second extension the Hurricanes awarded to a forward in little over a week, after agreeing to a five-year, $27 million deal with Teuvo Teravainen on Jan. 21. Which Adam Sandler flick made the cut, which Will Ferrell movie makes him laugh the most, and what 1977 hockey classic has he seen more times than he can remember? Grab some popcorn and check out this week’s edition of My Top 5.